Democrats’ favorite states include Hawaii, Massachusetts, Oregon, Washington, Vermont, Colorado, and New York, and their least favorites are led by Texas, Alabama, and Mississippi. Republicans love Alaska and Texas, and absolutely hate California, followed distantly by Illinois and Massachusetts. So the greatest partisan gap is for California, which Democrats like 91 points more than Republicans do, followed by Texas, which is favored more by Republicans by 82 points. Black voters dislike 10 of the 14 Southern states. Frankly, I’m surprised so many people even have opinions at all. I mean, Hawaii, sure. Everyone loves Hawaii. But 51% of the respondents expressed an opinion about South Dakota. Who the hell has an opinion about South Dakota? Beats me. 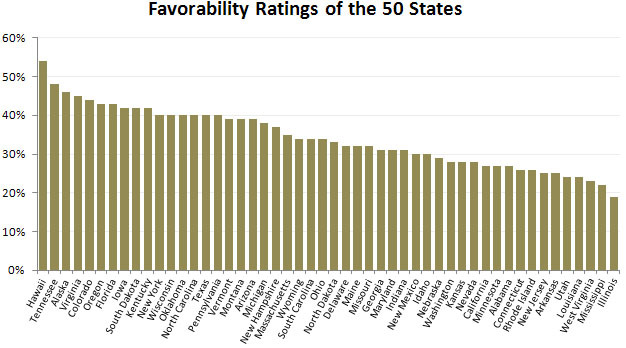 In any case, the chart below shows all 50 states ranked by the number of people who feel favorably toward it. How did your state do?